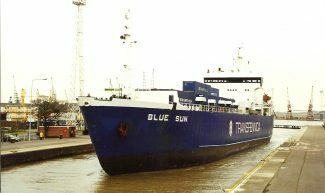 The coastal vessel BLUE SUN in Tilbury locks. 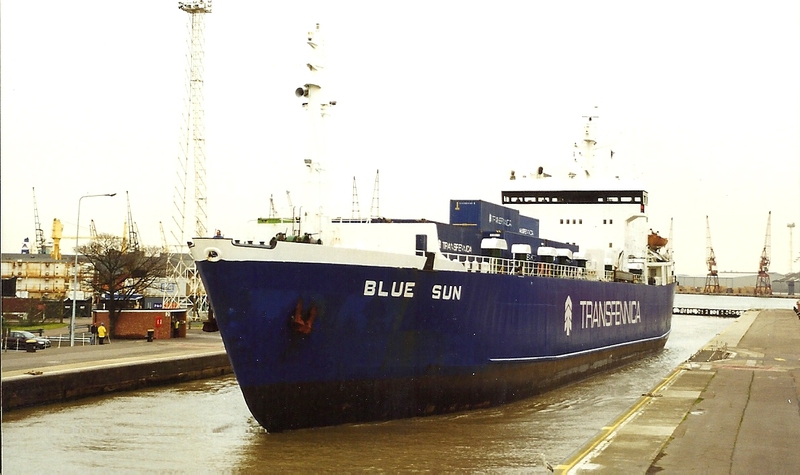 The roll-on/roll-off vessel BLUE SUN (1599 tons gross) started life with Swedish owners in 1975. When Jack took this photo (sometime during 1993-2004), the vessel was owned by Kos Maritime Ltd, a Norwegian company controlled by Lund, Mohr & Giaever-Enger, of Bergen. It has had several owners and names during its career and under its latest name, LIDER ADMIRAL, I believe that it is still trading in the eastern Mediterranean.